Last week, we gladly announced the onset of spring. The flowers in our yard look really amazing, and when we got back from a weekend away, the dogwood tree was in full bloom. Everything is green, fresh, vibrant, and bursting with the energy of new growth. Looking at recent blog posts, however, things aren’t quite as fresh and light. Garlic french fries, macaroni and cheese, corn dogs, hamburgers, leek bread pudding, fried pickles, and of course, the infamous and delicious fried macaroni and cheese. Put all of these together and we make Hardees look like an organic vegan salad bar. With the weather warming up (high of 90 degrees today!) and our stomachs full of delicious, but way too heavy food, we think its time for a change. We’ve been making many more salads recently than the posts on our blog suggest, and it’s time to share those with you. Niçoise salads are not too hard to find in quality restaurants, but most try to jazz up the salad even further by using seared tuna in place of the canned tuna. In addition, most restaurants also feature boiled potatoes, which, as it turns out, is not quite as authentic as I thought it was. We tried to make a salad that was more true to the classic version, and it’s a great combination of fresh tastes that really lightens things up for spring. 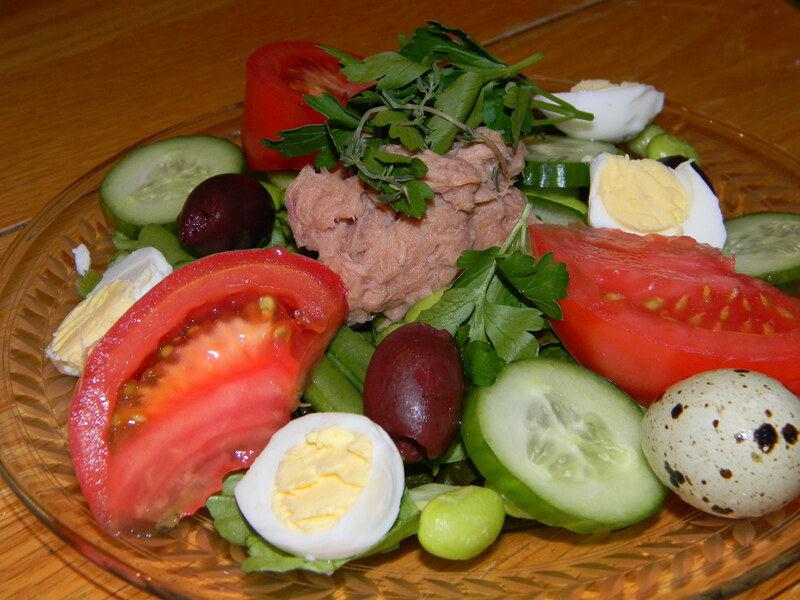 I’m not a salad person, but I do like tuna nicoise made with canned tuna! yum! I definitely need to lighten things up for spring too!